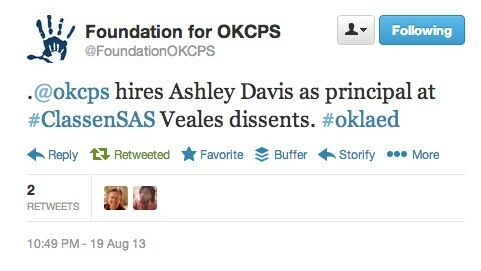 This evening at 10:49 pm, the board of the Oklahoma City Public Schools voted to hire Dr. Ashley Davis as the new principal of Classen School of Advanced Studies. Dr. Davis has extensive experience as a school administrator as well as classroom teacher in Oklahoma City Public Schools as well as other districts in the OKC metro area. She taught at ClassenSAS when the school was initially opened in 1994, and most recently has been serving as the Curriculum & Assessment Coordinator for Yukon Public Schools. ClassenSAS PTSA welcomes Dr. Davis back again to our school family! August 19, 2013 in Announcement.